The Kenwood D710GA has been working well since it was installed. Transmission and reception seem good, the APRS has worked as expected, the display is nice (but not quite as nice as the Icom 5100A), and it's great having it securely mounted under the passenger seat. But the built-in speaker - that leaves something to be desired. With the Icom, I had no trouble hearing what contacts were saying, but even with the volume turned all the way up on the Kenwood, it's just slightly too quiet for me to parse what's being said. Luckily (and of course), there is an external speaker jack, so I figured I'd get a speaker and the problem would be solved. However, as I looked into speakers, I wasn't happy with any of them - they were all too big and bulky, and none of them had great "attachment mechanisms" (by which I mean they all wanted you to drill a couple holes in some part of your interior to install their mounting bracket). So I decided, why not build one myself? I could make the case out of some scrap maple, find a low profile speaker, and attach the whole thing to the driver side lower trim panel with some Velcro. So, that became the plan. 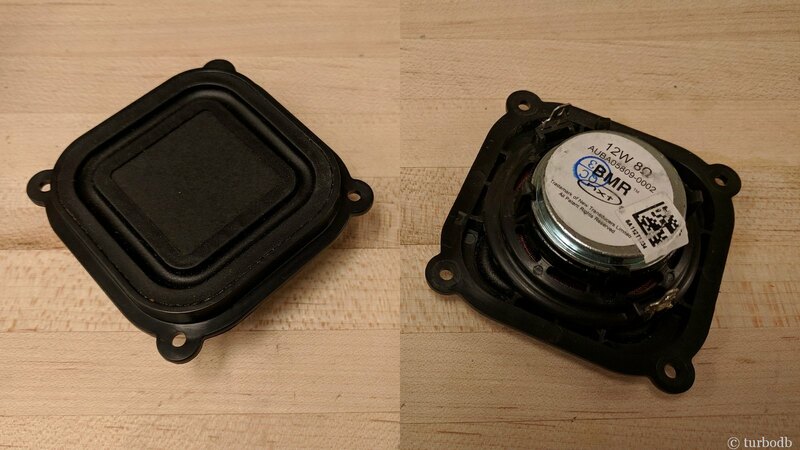 I started with a 2" speaker that was only ¾" deep - an 8 Ohm HiWave BMR12. I hoped that its promise of full-range, would turn out to be close enough to true, and that it would be loud enough for my use. Next it was time to create a small box. 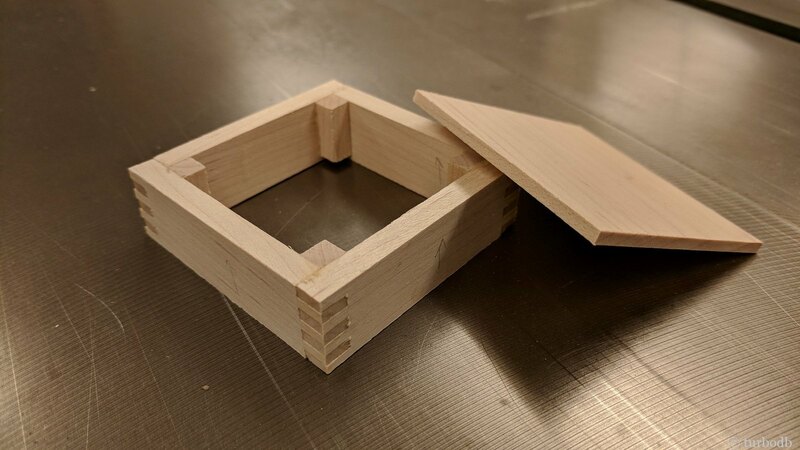 Trying to keep weight and bulk down, the corners were the only real "interesting" part of this box - I needed something that would be strong despite the size, and so a box joint was the answer - lots of surface area for glue, and the joint itself would help keep the box square. 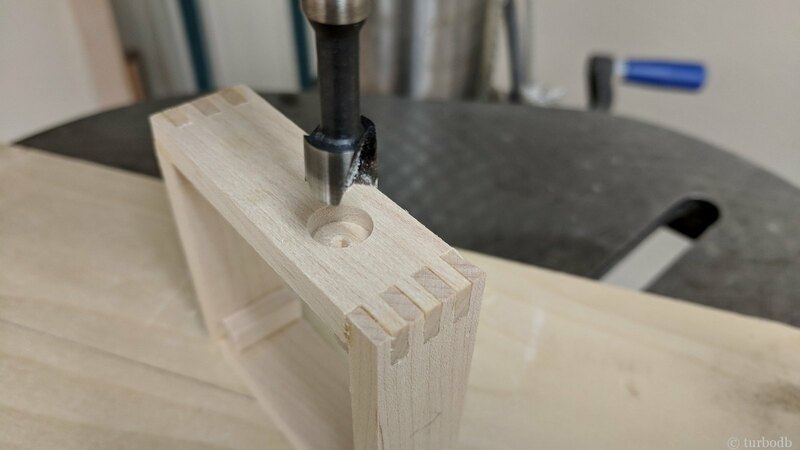 I added a few corner blocks as well to accept screws that would hold the speaker in. 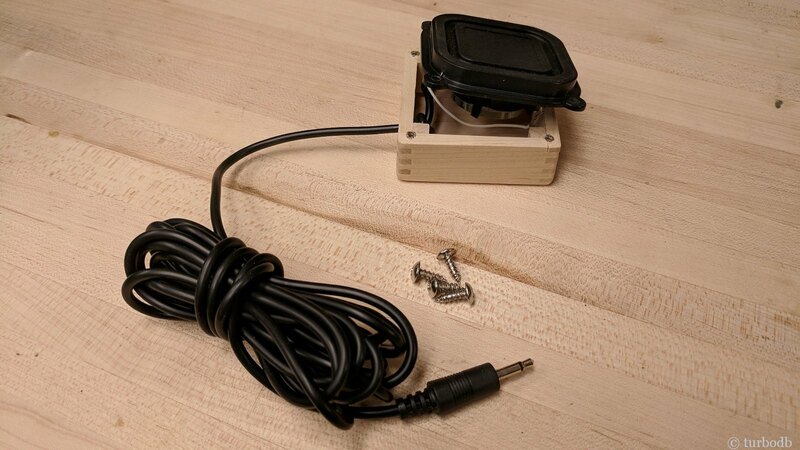 The box made, it was time to drill for a grommet that would allow the speaker wire to pass through. This was done with a 3/8" forstner bit to recess the grommet, and then a 3/16" bit for the through-hole. Several minutes of pushing and prying later, and the grommet was installed. Next, I glued the back on. 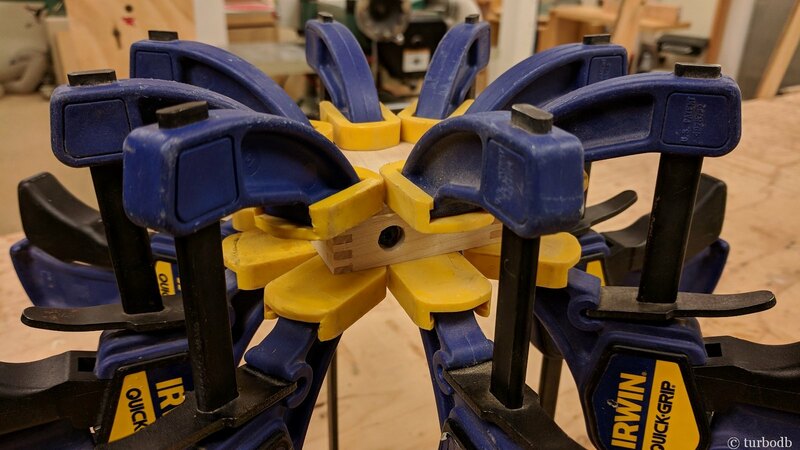 You can never have too many clamps when woodworking. 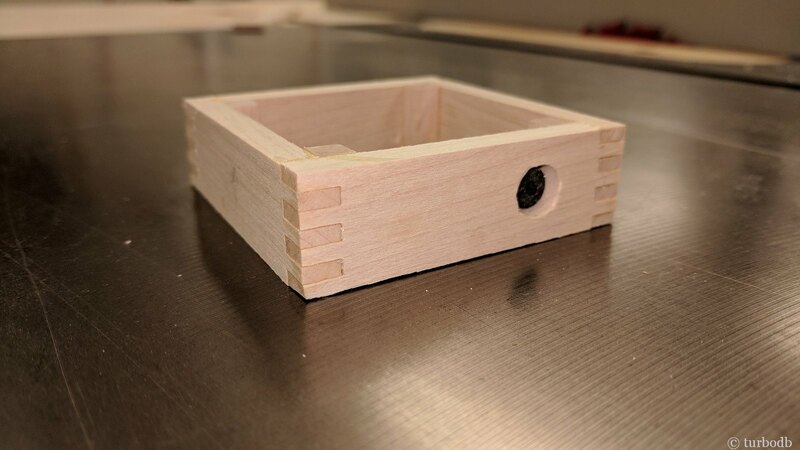 Finally, it was time to finish the box with a couple coats of polyurethane and wire and install the speaker. As for installation - as I was looking around for a place to install, I realized that my seat covers provided the perfect answer. These covers also came with head rest covers that I didn't particually like when I installed them, but have since become invisible to me. Now, they'd provide the perfect location to stash the speaker! 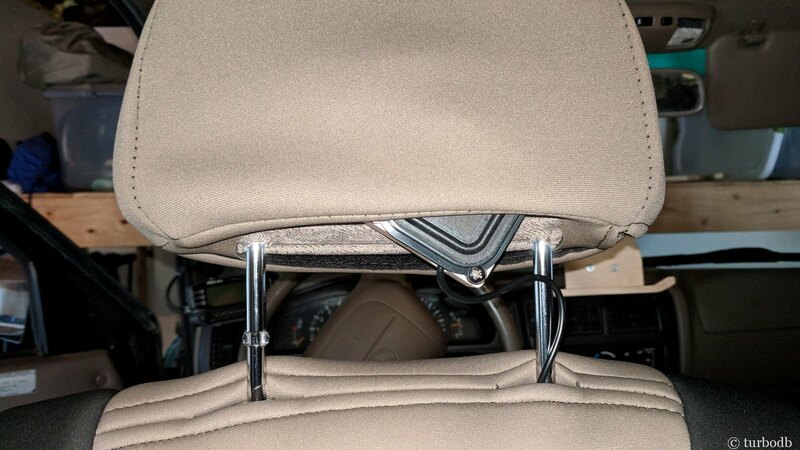 So, I pushed the speaker up into the back of the driver-side head rest and ran the wire down under the seat cover, under the center console, and directly to the Kenwood radio. I gave it a test, and it's loud. Perfect.